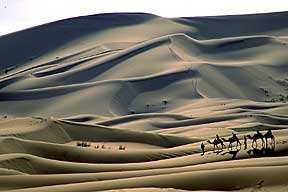 Adventure and budget travel tours to Morocco with Journey Beyond Travel. on any article page. More! Marrakesh: a destination that beckons with an exotic hand and brings to mind the scent of spices, illicit smoke and camels. I had wanted to go there for years, so when I finally got round to it with Anna it was the fulfillment of a dream. On first entering the mud-caked streets we expected to be swamped by children with open palms, devious-looking 'guides' and numerous offers of doubtful substances. 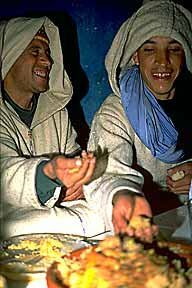 But after choosing a bright little boy of around 10 who offered to guide us after asking him the way to our riad, we hurried behind him down a maze of sun-baked streets as he occasionally gestured away the potential attentions of some of his peers. A couple of coins in his palm on our safe arrival brought a beam to his face that was ample reward for our trust. We later learned there has been a clamp-down on people hassling tourists - and it seems to be working. Anna was not impressed by the doubtful-looking adobe exterior of our riad, however, and I could tell she was almost on the verge of calling back our little guide to take us somewhere else. "I want to stay in a hotel," she said, forceful eyes accentuating her intentions. But my researches had already told me there were few hotels in the Medina, where I was eager to stay, although two have sufficient fame - perhaps past glory - to be worth mentioning here: the Mamounia and the Tichka (once frequented by Mick Jagger). The scene today is the 'riad', a series of inward-looking rooms arranged around a central courtyard. And as Anna was thankful to find, once we have entered the doorway to our chosen riad and penetrated to its courtyard, everything seemed different on the inside. Here was a green and enchanting haven of tranquility, complete with cane rockers, rush mats, banana plants, palms and extensive greenery. What was clearly a dining table stood to one side beneath shady palms and I could already anticipate the pleasure of eating our breakfast there. Anna's eyes now sparkled as she took it all in. "Glad we chose a riad, Adrian." Our host appeared, a great beam spreading across his weathered-brown face that exhibited more creases than a fan, bob-bowing, exposing a row of crooked but surprisingly white teeth. Although of small stature, he insisted on grabbing all our bags, somehow staggering ahead of us to our room up steep stone steps reached directly from the courtyard. The central courtyard itself is the soul of any riad, and they offer such a contrast to the vibrant streets and alleyways that surround them. They feel like safe havens within a bustling throb of humanity. Riads are the typical houses in the Medina and we later discovered they range from traditional to modern. Cheekily we looked in on a few others that week on the false pretext of looking for somewhere to stay the following week. All tastes seem to be catered for. Carved wooden beams, highly-coloured ornamental tiles and a kind of polished plaster known as tadlekt represent some of the decorative styles employed. A chance meeting with a photographer on a magazine shoot a couple of days after our arrival gave us a much greater insight into the riads. Apparently the exotic backdrops offered in Marrakesh attract no end of advertising and film types and, as a result, many moguls have decided to set up homes there. A property explosion ensued. Apart from these private homes, it is estimated that of the 3,000 odd authentic riad houses in the Medina, around 10% of these have been converted into guest houses and maisons d'hôtes with around 4 to 10 bedrooms. There is a fare share of Westernized riads where chic and traditional vie to please the nouveau riche. Marrakesh has changed a lot over the past few years and now Parisian-owned nightspots set the scene for trendy young things to drink their way into a new social scene. But do not let this give you the wrong overall impression of the place, for the central square of Jemaa el Fna - know simply as 'la place' by the French-speaking Moroccans - still throbs with authenticity and the narrow streets and alleyways of the Medina still ooze character - if not always charm. This is still the place to go if you wish to buy a sheep's head, make a mark on a pyramid of spice, buy a shirt or collide with a donkey - or run into its trail, as it were. The contrasts within this square are enormous, and the juxtaposition of scents, sounds and sights is something that will last with you for ever. Imagine these stalls for a moment. They sell spicy tagines, ratatouilles and shashliks. Pastries, T-shirts, vegetables, necklaces. Leatherwear. Cooked meats. And the cocktail of smells that assails the olfactory sense from all this has also to take in horse dung, the sweat of humanity, and the gentle perfume of generator exhaust. During the day the sweet music of the cash register abounds, but at night the sound of a more wailing kind of music is more prominent and the entertainers come out, complete with the obligatory snake charmers, quack doctors and story-tellers. Watch out for the transvestite dancers exercising their bellies and enjoy the booming drums and finger symbols. Take mint tea at a café. Just the sights and sounds of Marrakesh may be enough to sate the appetite. This is, perhaps, as well, for culture is difficult to find. Bear in mind the mosques in Morocco are closed to non-Muslims. But you might like to take a trip out to the desert, look at the Bahia, a heavily-over-decorated 19th century palace, contemplate the Medersa Ben Youssef with its peaceful patios, pools and arches, or rest in the Majorelle Gardens, restored by that icon Yves Saint Laurent with its (to me) strange mix of green foliage and cobalt-blue paint. But, then again, incongruous juxtaposition really is the norm in Marrakesh. It is truly the place to experience the spice of life. If you enjoyed reading the above article then you will probably also enjoy Kenya, also in Africa, and our latest articles covering the Orinoco Delta, La Mata, Marbella and Beijing.